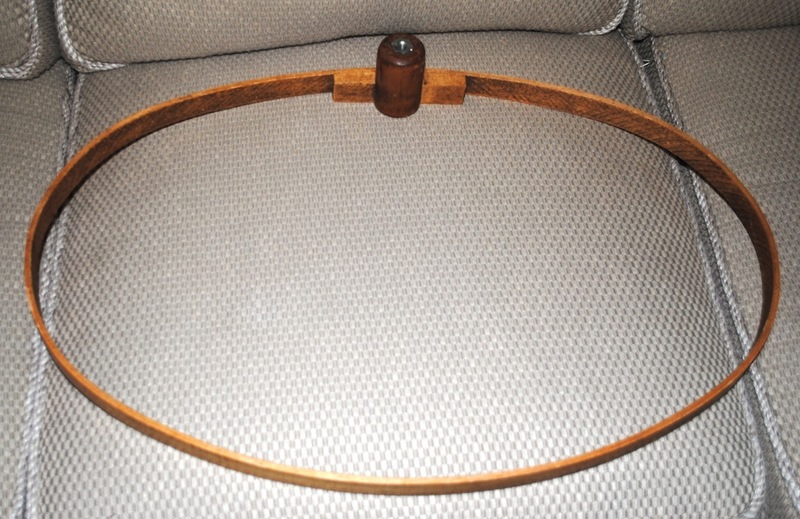 This is a picture of my quilting hoop that I bought at a garage sale before I ever started quilting. See the knob thing on it? It looks like the knob is supposed to screw down onto a post or floor stand. I've looked on the internet & don't find anything exactly like it. Do any of you have one like this? Or know who makes them so I can maybe get the floor stand part? Barring any info on that, what type, kind, brand of quilting hoop do you hand quilters prefer? I've just started doing some big stitch, my first hand quilting, and I may love it! Do you have the second hoop that fits over the one shown? The knob does look like it was part of a floor frame or lap frame. The hoop shown is the inner hoop that goes under the quilt sandwich with a slightly larger hoop the fits over the quilt sandwich. I don't know what kind of hoop that is, sorry, so I can't help you there. But it does look to me that you have only one of the two rings which made up the hoop. It may or may not have had a stand. You asked what kind of hoop we all use, so I'll tell you mine is a Hinterberg lap hoop, which I love. It tips and swivels 360 degrees. Both hands are free to control the quilt and quilting. Neither hand has to hold the hoop, which I found hard to do on a hoop with no stand. I think you may have to just give up on this hoop and get yourself a new one. What are the chances you are going to find someone with only the other half of this identical hoop for sale? Oh, I'm so sorry I mislead all of you. I do have the other half of the hoop and I'm using it on my current project. I just wondered if there is a way to find the floor stand part. The hoop itself works fine though the knob part gets in the way. I'll probably be buying a new hoop soon as I figured I wouldn't be able to find the floor stand part. Thanks for your replies & suggestions. I'm really enjoying the hand quilting. My fingers are sore. Not sure that you'll be able to find a floor stand for that hoop. Might have to start from scratch with a floor stand hoop if that is what you're looking for. Me, I just use the hoop in my lap. That way I don't need to be in a certain position for any period of time. Plus I can take it with me if I want. Most floor stands for quilting hoops have two points of contact, don't they, one on each side to bear the weight of the quilt? This hoop only has one which makes me think perhaps it's for embroidery or needlework, something lightweight, not quilting at all. I'm also wondering how the OP is using only one half of the hoop in her current project and how the knob part gets in the way when she uses them both together. Even on a stand, it would still be 'in the way', probably more so since a stand would be attached and there would be less flexibility of position. Guess I'm just in a wondering state of mind this morning. I'm using both pieces of the hoop, not just the one pictured. I'm quilting holding the hoop in my lap and the knob gets in the way of my hand when I'm quilting in that area. You may be right that the hoops were meant for embroidery. All the ones I've seen do attach in two places. Guess I'll have to buy a new hoop. Turn the hoop (both parts) over so the knob faces down, under the quilt layers, while you quilt. That should get it *mostly* out of the way. Thanks, Jan. It's still annoying that way. It's a pity since it's nice wood. well shoot I gave one away! recently too. never used. Oh well.